Vijay Raghavendra is a popular actor of Kannada, known for his work in films such as "Chinnari Mutha", "Ninagaagi", "Romeo Juliet", "Rishi", "Bhajarangi", "Mason", "Jani", etc. . He is the son of the producer S. Chinne Gowda and the cousin of actor Kannada Rajkumar. In 1982, at the age of 4, he began his performance as a movie with his uncle Rajkumar to the front. He worked in eight films as a child artist and went to Chennai to learn game techniques. In 1995 he won the National Film Award for the best children's artist for the film "Kotreshi Kanasu". 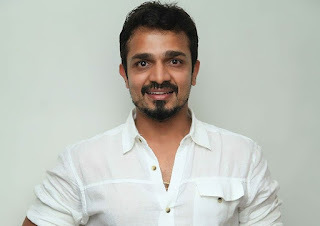 In 2013 he won the title "Bigg Boss Kannada-1". In 2014 he also organized the radio show 'Nenapina Idiot-Box' at 92.7 Big FM. In 2016 he won the "Karnataka State Film Award" as Best Actor for the film "Sri Shivayogi Puttayyajja". In 2016 he appeared as judge in 'Dramo Juniors'.